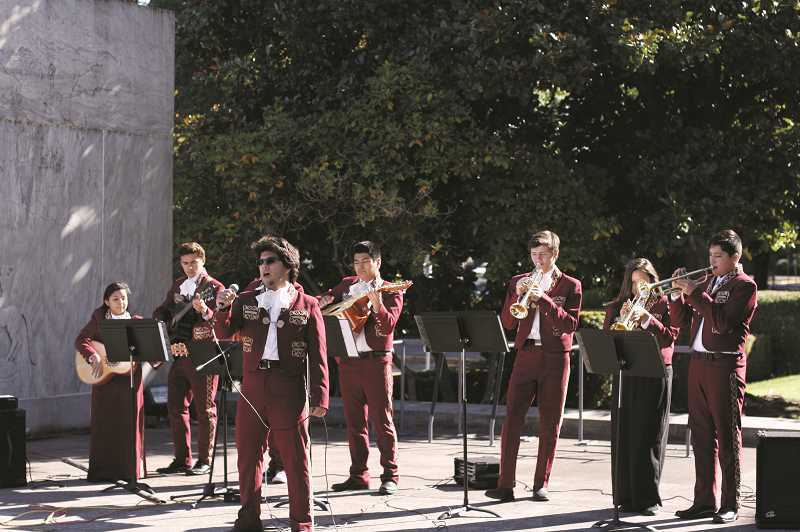 Once again the Woodburn High School Mariachi Band will be a featured act on Earth Day. Marion County announced that the 50th annual Earth Day will be celebrated regionally at the Oregon Garden in Silverton with the 2019 Earth Day Fair, 10 a.m. to 4 p.m. Saturday, April 20. Within that schedule includes the WHS Mariachi Band, which is scheduled to perform at 2:15 p.m.
First formed in 2003, the Woodburn ensemble was the first high-school Mariachi band in Oregon, emerging through a drive to have a musical presence at the school that reflected is largely Latino student body. 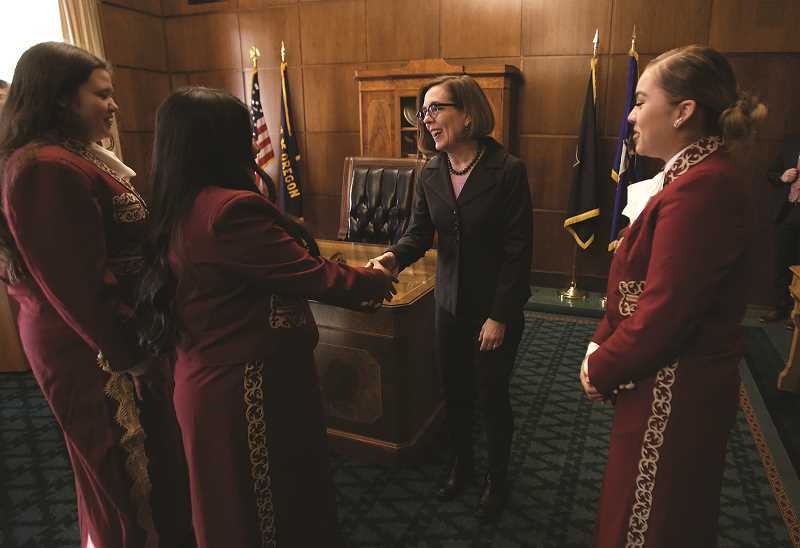 "There are currently six others (Mariachi bands), I believe, including Springfield, Hillsboro and Forest Grove," said Brian Gingerich, who created and directs the Woodburn Mariachi contingent. "One of my original goals with the group was to perform traditional Mariachi music with traditional instruments. From the outset, that has been accomplished." The group has since performed at a wide-variety of events throughout the Pacific Northwest, including Portland's Cinco de Mayo, the Rose Festival Grand Floral Parade and other festival events, visitations from former Mexican President Vicente Fox, Civic Rights leader Dolores Huerta's visit to Western Oregon University, Governor Kate Brown's inauguration and at Portland Trail Blazers events. Gingerich takes pride in how the band's popularity has grown over the past 15 years. "The group quickly grew into a phenomenon, in that, requests for performances were many," the director said. "The band usually performs 30 to 40 times during the school year. I turn down a lot of requests for performances because I don't want to burn out the students or myself. The band does not perform during the summer." In addition to the Earth Day Fair in Silverton, this month the band performed at St. John's Public Library in Portland and has a gig scheduled during Oregon State University's Ag Day, 11 a.m. Tuesday, April 16, in Corvallis. Marion County Solid Waste Coordinator Alan Pennington said WHS Mariachi Band has been an Earth Day presence since 2013. It is the only day of the year that admission to The Oregon Garden is free to everyone. "This is one of the performances to which the kids look forward. They like the atmosphere and the fact that the room is usually full when they perform," Gingerich, said. "It also gives the families of the kids a chance to visit the garden on their one free admission day of the year. It's good stuff." Marion County Public Works Environmental Services is teaming up with Renewal by Anderson, Salem Sign Company, Leaf Filter, Budget Dumpster, K2 Creative, the Oregon Department of Energy, and The Oregon Garden to host the fair. Pennington said the Earth Day Fair will feature a number of hands-on, earth-focused projects and presentations, such as how to master backyard composting, make your own reusable bag, create your own seed starter pot, and similar sustainability-oriented activities. "Visitors are invited to enjoy Oregon Garden's 80-acre botanical garden, featuring more than 20 specialty gardens," Pennington noted. Pennington added that educational exhibitors, along with several non-profit and student groups, will be located in the Garden's Grand Hall. In addition to WHS Mariachi Band, the celebration will highlight music from the Early College High School Emaa Da drumming band and Ceili of the Valley Scottish dancing. A local food vendor will offer a variety of tasty items for purchase. On-site parking costs $5, but free parking and shuttle service will be offered from the gravel lot north of Roth's Fresh Market in Silverton, and at Robert Frost Elementary, 201 Westfield St., Silverton. For information about WHS Mariachi band, visit www.facebook.com/whsmariachi . For information about The Oregon Garden or details about Earth Day Fair, visit www.oregongarden.org.